Last week, Carol Thatcher unwittingly illustrated how an archaic word from a different generation retains much of its racially-charged potency to this day - and rightly drew condemnation for it. This week, it was the turn of imagery to dredge up the unseemly spectre of the past. A storm of publicity has gathered around the offices of the New York Post, after a cartoon published in Wednesday's edition of the newspaper - depicting the author of the recently-approved economic stimulus as a dead, crazed chimpanzee - was accused of being a not so subtle exercise in jingoism by both commentators in the media and civil rights activists. Speaking to the media, Reverend Al Sharpton declared that "the cartoon in today's New York Post is troubling at best given the historic racist attacks of African-Americans as being synonymous with monkeys." "One has to question whether the cartoonist is making a less than casual reference to this when in the cartoon they have police saying after shooting a chimpanzee that ‘Now they will have to find someone else to write the stimulus bill,'" he added. A press release was quickly issued by the newspaper, defending its cartoon as "a clear parody of a current news event" - the shooting dead by police of a chimpanzee in Connecticut on Monday after the creature mauled its owner's friend - and denouncing Rev. Sharpton for being "nothing more than a publicity opportunist." However, with the furore over the cartoon refusing to abate, and a group of protestors converging on the newspaper's headquarters, the Post softened its stance in a Friday editorial, saying that "to those who were offended by the image, we apologise." Whether simply a poorly executed sketch that was misconstrued - as the Guardian's USA blog rightly points out, the author of the stimulus package referenced in the cartoon would be the Democratic congressional leadership, not President Obama himself - or something more sinister, the controversy surrounding Sean Delonas's work highlights an interesting dilemma: the challenge now facing the professional satirists whose job it is to subvert the image of the first African-American president of the United States. Distorting facial features as a means of highlighting the excesses and frailties of our public figures has been a staple of political satirists' trade in the western press since Thomas Nast's pioneering work during the Tammany Hall era, providing some iconic and enduring images: from the defiance of Winston Churchill's bulldoggish scowl to, more recently, Tony Blair's unnervingly large and perfectly-formed dentures and the increasingly simian features of George W Bush. However, as highlighted recently in an article on the Huffington Post, cartoonists in the American press now find themselves in unchartered waters, as they try to tread an increasingly thin line between caricature and stereotype when penning their work: draw President Obama's lips too large, or his ears too big, and an artist may inadvertently face the same charges of racism and xenophobia levelled at the New York Post this week. As CNN columnist Roland S. Martin succinctly put it: "What could be seen as silly humour if President George W Bush were in the White House has to be seen through the lens of America's racist past." Tell Rall, president of the American Association of Editorial Cartoonists, summed up the difficulty this paradigmatic moment in American history has invariably posed for his organisations' members, noting that, "without a doubt, people are stepping more gingerly. People are tiptoeing their way through this." The alarm bells should have sounded for many during the general election. 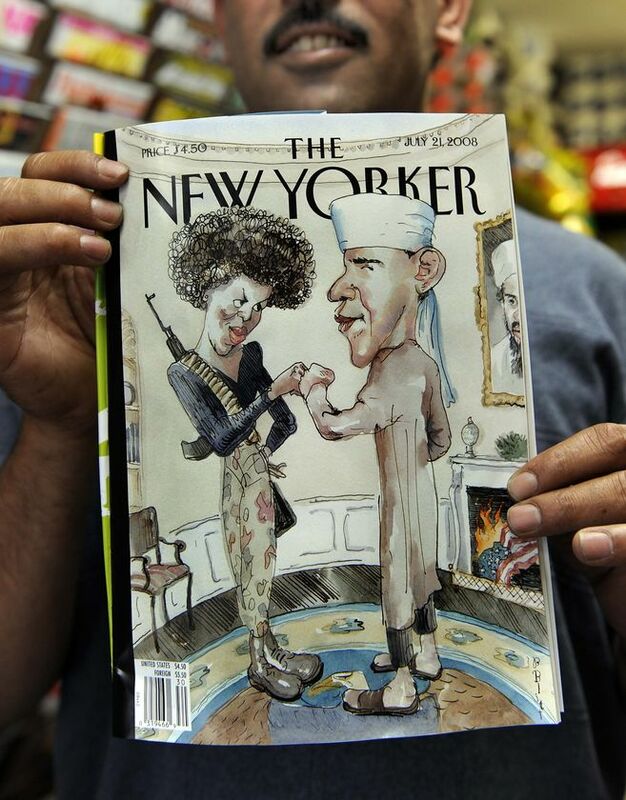 Seeking to poke fun at the right-wing media's continued chatter over Obama's "true" religious beliefs and purported affiliation with terrorist organisations, The New Yorker magazine placed on its front cover a depiction of Obama and his wife standing in the Oval Office: replete with turban, salwar kameez, camouflage pants and an AK-47 rifle. The cartoon, while playing on the issue of religion rather than race, was quickly rounded upon by critics who believed it reinforced popular misconceptions about the Democratic candidate - including his own campaign, which denounced it as "tasteless and offensive." With more than 45 months left in President Obama's tenure, it seems inevitable this issue will arise again; particularly given that interest groups such as the NAACP are set to become even more vigilant in their monitoring of the media's output after this week's incident. Consequently, political cartoonists now face the unenviable challenge of marrying outrageous and provocative iconography with political correctness: a damning restriction of free speech, which may, ironically, provoke a self-fulfilling creative backlash that results in the production of more vitriolic and jingoistic works. As decorated American cartoonist Jules Feiffer noted, "outside of basic intelligence, there is nothing more important to a good political cartoonist than ill will." American political cartoonists are starting to get tetchy.